2 start batteries 24 Volts - 250 Amps. 1931 build by the Franco-Belge yard in Villeneuve la Garenne, built for the famous Solvay company, this particular one has got the number Solvay 73. Main access through the spacious and insulated wheelhouse, double glazed windows made in wood-look aluminium and completely folding. Access to the boatman's cabin in the aft, transformed as a studio, with shower, heads and sink. Forward, stairs leading to the main live aboard area, saloon with open galley, all electric. A corridor leads to the cabins forward. first a huge bathroom with shower and heads, also a washing machine in the corner. second room, a spacious cabin transformed into a sport a sauna space area (note the sauna is for sale under separate negotiation). After there a 2 double bed cabin and forward cabin, with a single bed used as an office room. Central heating through radiators (diesel burner Chapee) and extra electric heaters for more comfort. There is no water tank on the boat as water is filtered on board. A 3500 m² LAND IS INCLUDED in the price (40 m of water front and 87.5 m of depth). The boat could be sold separetely by negotiation. 3500m2 of closed garden planted with fruit trees, an automatic gate and the entrance and a double garage. Also a hut, and a covered terrace and barbecue area. Further building is not allowed and the land is classed as recreational. manual windlass with 2 anchors and 40m of chain. Bilge pump alarms (both sound and visual and located in the wheelhouse and in the boatman's cabin. smoke detectors in the live aboard area and in the boatman's cabin. Live aboard Freycinet type barge for sale in France with a closed and immaculate 3500m2 garden mooring. 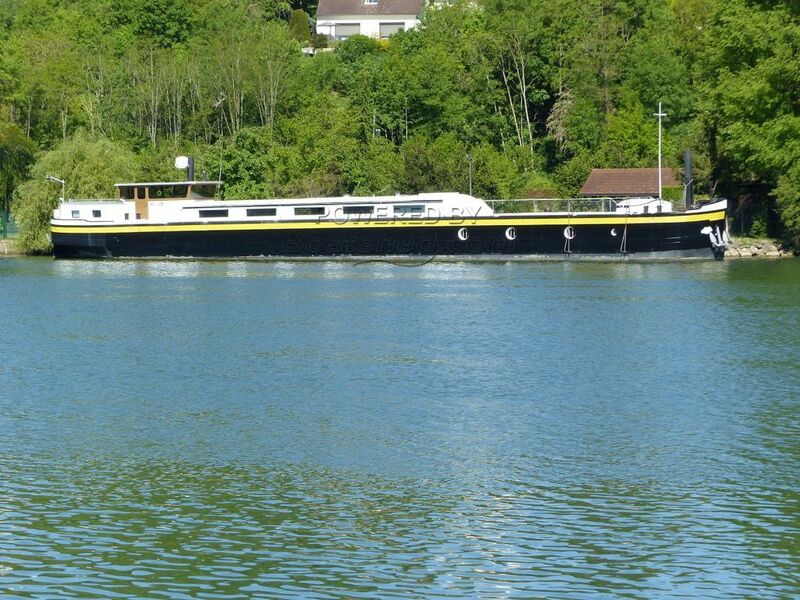 Boatshed Paris is pleased to offer this fully live aboard barge for sale with private garden moorings close to Paris. The land includes solid mooring installations a planted garden, completed with a double garage, a covered terrace with barbecue area and a garden shed. An idyllic rural mooring close to Paris. The barge is a very well maintained 38m cruising home suitable for a family. Main accommodation includes 3 double bed cabins, a spacious and practical all electric kitchen, an office and a sauna room. The office and sauna room could be turned back into cabins if required. The original boatmans cabin aft has been fitted out as separate self-contained accommodation. A great opportunity to purchase a liveaboard cruising barge with an idyllic mooring in Paris area but in a safe and rural environment. Ideally for a family or a B&B project (subject to the usual permits). This river barge has got its CERTIFICAT COMMUNAUTAIRE (TRIVW) valid until , March 2023. The boat could be sold without mooring. Please contact, Pascal GAETAN, your local broker at Boatshed Paris, for more information or to organise a visit. This Peniche Freycinet Including 3500m² Of Land With 40m River Frontage has been personally photographed and viewed by pascal gaetan of Boatshed Paris. Click here for contact details.